Kindred Combination LH UM 20 Ga sink - 17-3/4" X 26-7/8" X 8"
Two bowl undermount 20 gauge sink, with small bowl left hand position. Sink features hard wearing satin finished bowls, sparkling mirror finished rim, Spillway<sup></sup> partition to prevent water on the countertop, one white plastic colander, and included waste fittings. Rear drain position affords more storage below the counter. Quality assured with the standard Kindred Limited Lifetime warranty. Crane is one of the best-known manufacturers and distributors of plumbing fixtures and specialty plumbing products in North America. The Company offers various products and product lines that comprise all aspects of bathroom fixtures from a small porcelain sink to a luxury acrylic bath. The Tuxedo pedestals hourglass leg and smooth, round basin will add a modern touch to your bathroom. Fabricated in white Grade A vitreous china, this pedestal offers a 8 inch center faucet drilling for your choice of 8 inch faucet. JSG Oceana's Cubix Undermount offers a distinct 3-dimensional pattern with an architectural flare. A smaller square under-counter install offers more countertop space in the bath. Made of "HARD ROC inch borosilicate glass, the durability of this lavatory makes it a lifetime product. American-made with a Lifetime Warranty. 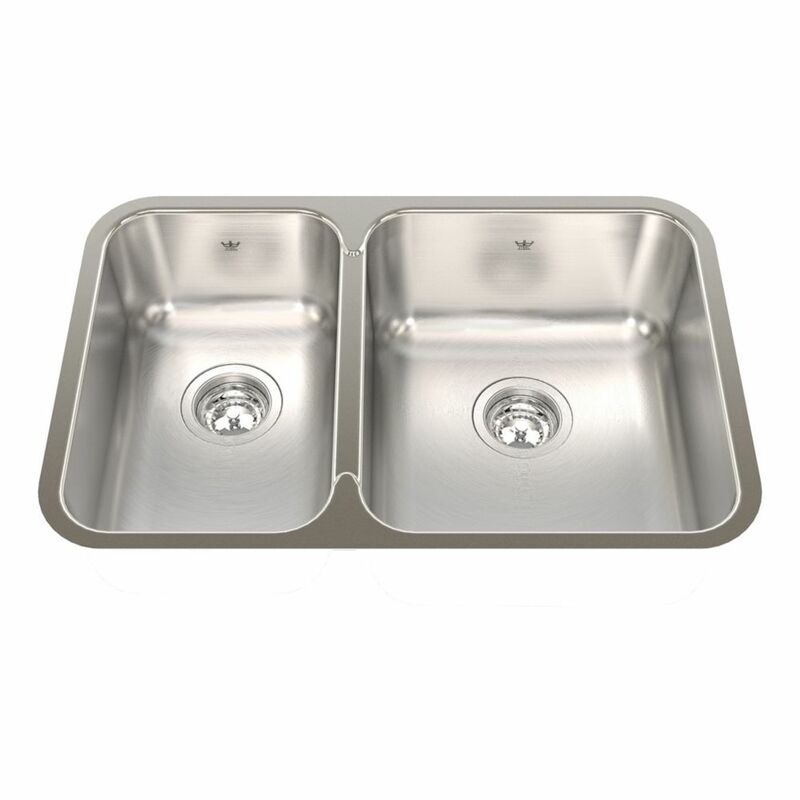 Combination LH UM 20 Ga sink - 17-3/4" X 26-7/8" X 8" Two bowl undermount 20 gauge sink, with small bowl left hand position. Sink features hard wearing satin finished bowls, sparkling mirror finished rim, Spillway<sup></sup> partition to prevent water on the countertop, one white plastic colander, and included waste fittings. Rear drain position affords more storage below the counter. Quality assured with the standard Kindred Limited Lifetime warranty.